This Hitachi drill is a terrific tool. We bought it as a replacement for our years old DeWalt. What happened is the old drill was killing batteries at an alarming rate. 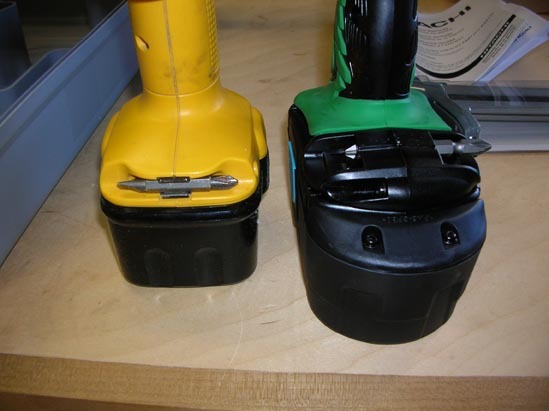 Even after purchasing a pair of replacement batteries for the DeWalt, we found that useful time of charge was dropping off. We've kept the old drill around, but it doesn't see much use anymore. 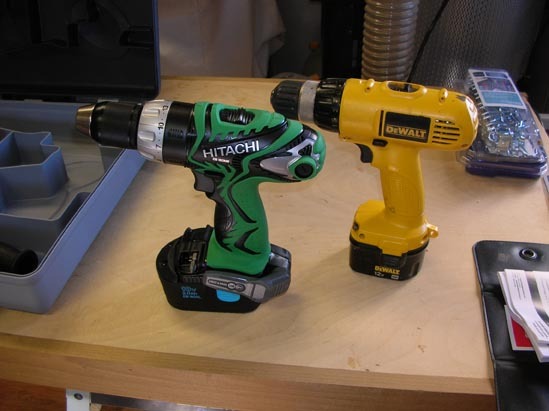 We chose this particular Hitachi model because of a cordless drill comparison in Consumer Reports magazine. This was the top rated model under "Drills For Tougher Jobs" category. We were surprised to find the same model available at the local Lowe's (so often the specific models cannot be locally). Ours came with a case, two 18-volt batteries, recharging station, external handle, and screw bit. Our older DeWalt is 12V, physically lighter, and saw many hours of use. There's no obvious way of checking the motor brushes so once battery life started going away, we jumped ship. 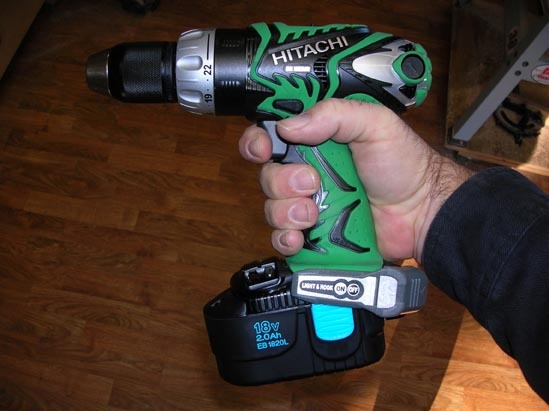 The Hitachi drill is an 18V, 2A unit. The torque is obvious from the first trigger pull. An adjustable clutch is easy to operate, the variable speed trigger is smooth, and reverse-direct switch is at the finger tip. High and low speeds are changed with a slide switch mounted on top of the unit. All of this is of course expected in a cordless drill these days. We haven't weighed these two drills, but can safely say that the Hitachi drill is heavier by about a quarter over it's older counterpart. It's mostly due to battery size. The added power comes in handy when driving 4-inch screws into 2 x 4s. It's fun to think about, but we've yet to use the leverage handle and think it's more a gimmick than anything else. Why the Hitachi came with a Phillips-only screw bit is beyond us. Not that we use much slotted screws these days, it's just a curiosity. Our large hand fits the Hitachi grip well. Smaller hands will also have trouble with the weight. Balance is good for us, but again, smaller hands may find this to be too much tool for regular use. There's a belt hook/light assembly on the drill handle. We find both to be of little use to us. The heavy duty chuck performs as directed. As does everything else about our new cordless drill. We appreciate the added torque, don't mind the weight, and can see where we can replace/service the motor brushes when faced with maintenance down the road. This Hitachi is a step slightly up from our older drill, yet in the same useful vein. 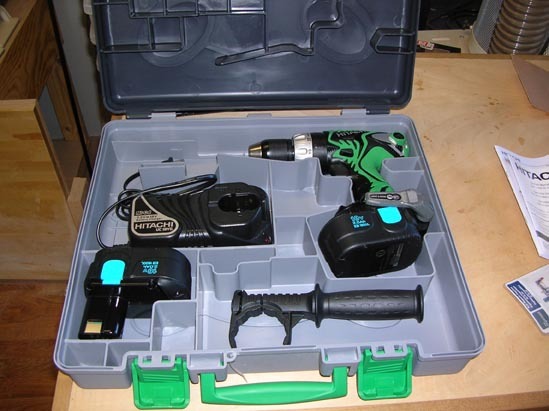 We have a small shop and use the case for storage when the drill is not in use. This keeps the charging station and spare battery clean. Recharge time is about 20 minutes. Retail price is $200, we caught ours for $175 on sale and consider it money well spent.